As an artist it always feels very special when someone asks you to create a painting on commission. It is a unique and very intimate experience that often makes the piece feel more personal. When working on commission I always make sure to meet with a collector in person whenever possible, to get an idea about what they have in mind and I make sure all parties are happy with the composition before moving on to the actual creation of the piece. I send pictures of the piece in all its different stages during the creation process so they get to see the piece come together from start to finish, something that is unique to the commission process. Commission pieces are always more personal and often require me to go out and photograph specific buildings or events to collect all the material needed. I love working together with my collectors to create the perfect piece for them! 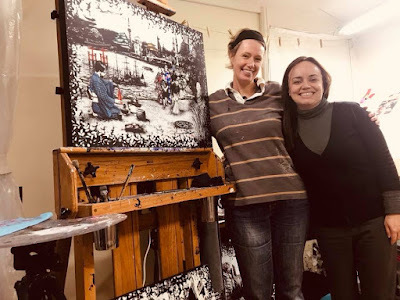 Last week I had the pleasure of revealing a newly finished commission piece titled 'Ichi-go-ichi-e' (一期一会) to my wonderful, passionate collector Olga. 'Ichi-go-ichi-e' is a Japanese saying that reflects the idea that each moment is unique and will never be repeated again so it should be enjoyed and appreciated. 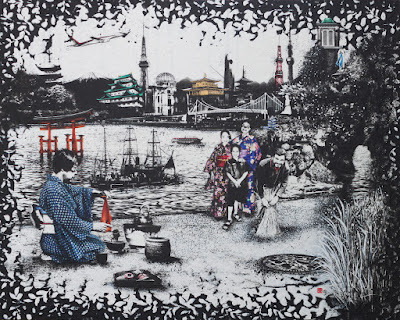 This piece reflects many special moments this beautiful family has experienced here in Japan, places they have visited, people they have met, as my collector so beautifully put it: "This piece contains our passion, our faith, our work, our precious moments is far and all we love so much in Japan! This is not only a piece of art! It is a memory to which we will look until we are old, and it will bring us back in time to all these moments again!" I feel very lucky to have been given the opportunity to create a piece that is filled with so many memories and so much meaning. It will be a very special addition to their collection that they will cherish for many years to come. Are you interested in adding a special commissioned piece to your collection? Please don't hesitate to contact me. I would be happy to work together with you to create your perfect piece of art!